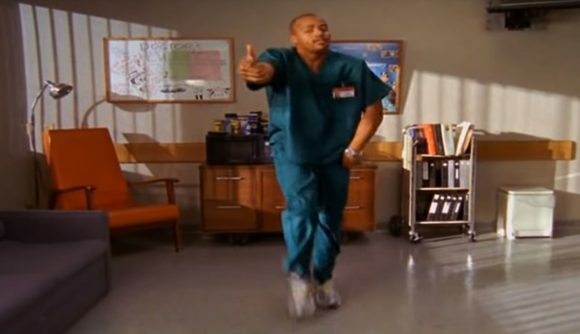 Donald Faison, the actor who played Chris Turk on the (brilliant) medical sitcom Scrubs, says that Epic Games “jacked” a dance he created for the show, and claims he hasn’t been paid for it. His comments follow similar complaints by hip-hop artists such as 2 Milly and Chance the Rapper, whose moves have also made their way into the game. Faison joins Snoop Dogg, 2 Milly, and others in having had their moves appear in Fortnite. In Faison’s case, the ‘Poison’ dance is Fortnite’s default dance move (which always struck me as unwise, because why would you want to use any other dance? ), so it’s especially prolific, but it’s also free – in a free-to-play game. Other dances are sold to players for real money, so Epic Games is profiting from them more directly. According to an intellectual property lawyer in this breakdown video from Insider, the US Copyright Office doesn’t grant copyright for individual dance moves – they’re treated more like words or phrases, and copyrighting them could infringe on other choreographers’ creative expression. Given that monetising dance moves in this direct way is such a recent phenomenon, the law may have some catching up to do.